The first solo exhibition of south London inspired art and illustration by Matt Bannister at Cafe Adagio, Croydon. I'm pleased to say that I currently have a solo exhibition, called 'Rounded Corners', on the outskirts of Croydon, at Café Adagio. The display contains new and older art and illustrations of mine, all responding to the sights, characters and architecture of south London. I created six new acrylic paintings (and some pen and ink illustrations) specifically for the exhibition, each featuring a different view of Croydon sprinkled with a few local characters. The people in the works are inspired by the shoppers, children and commuters I've seen nearby, so you may even recognise someone if you live in the area! The other pieces are influenced by a diverse range of south London places: brutalist architecture in Southwark, hungry shoppers in Borough Market, Victorian arches in Crystal Palace and brand new shiny tower blocks on Wellesley Road, Croydon. Some of the framed Borough Market illustrations in the show have featured before on this blog, when I completed them back in September 2013. I still go there to ogle all the food. "Matt Bannister is an illustrator and artist obsessed with architecture and people. He creates bold and hand-drawn imagery full of character and is regularly inspired by the urban landscapes of South London. After studying fine art at university, he worked for the BBC for 13 years but has recently picked up the pen/brush/pixel and returned to creating his own work. Recent successes of his include two large bus sculptures for the TFL bus trail in Croydon, covers for The Croydon Citizen, and illustrations for Nesta and Universal Music. His imagery inspired by Crystal Palace is a popular favourite in the SE19 area too." 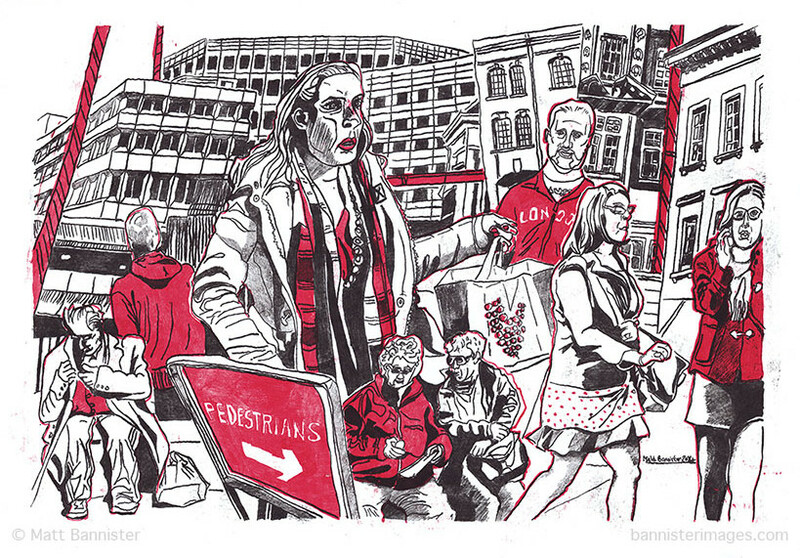 There are pieces inspired by Southwark, Crystal Palace and Croydon to be seen (and purchased). In addition to the framed originals on sale in the café, limited edition digital prints of some of the new Croydon work are available to buy here. Here are a couple of pen and ink drawings that I made recently. Drawn from photographs that I've snapped at various times in and around the London Bridge area, and pulled together in a montage/collage style. I'm working up to a bigger piece that will encompass the Borough High Street (and occupants), so these are indirect preparation for that, I think.